We normally get asked if our sheaths or holsters can be mounted in a particular fashion. Reason #1 - Strength. First and foremost. Ridiculously Overbuilt is not just a slogan. It exists in every product that we make. Our bindings support each other, and back each other up. They are spaced far enough from the edge and the blade so that they are protected as is the blade in the event of a fall, etc. The edge protects the eyelets, which reinforce one another while protecting the blade and holding everything together. Reason #2 - Modularity. Any accessory that we make will mount on any product that we make. The spacing from the edge of the sheath to the rivets, and from them to the blade has a minimum value in order to accept any and every mounting accessory (To include Tek Lok, and Molle Lok). We don't believe that you should have to purchase a new sheath just because your needs might change given your mission or loud-out (Same for holsters.). This holds true for civilians as well. Hiking or camping during different seasons, or in different environments, places different requirements on your systems, and as a result you, the user. Our sheath platform can accept any mounting accessory, anywhere along its edge. This takes a minute to really sink in. This means that every sheath or holster can accept any mounting accessory, and the sky really is the limit. Sheaths mounting accessories can be used on holsters and vice versa. 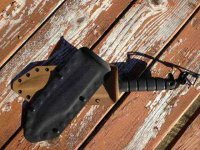 Sheaths can be mounted right or left handed, strong or weak side, or inside the waistband for concealed carry. They can be mounted upright or inverted, or mounted laterally. This is all built into the sheath/holster/carrier design so that, if one day your needs to change, you can simply purchase the correct mount for that occasion, and use it on your sheath, anywhere along its edge, not just the top. Everything is customizable and adjustable by you, the user, using a simple flat head screwdriver (or the back of your knife, or something else in your kit - No need to carry the extra weight of a multitool. The tool is in the sheath. ).